Are you a luxury-minded driver who values durability, reliability and spaciousness? If so, you might be in the market for a new GMC Denali model. Whether you're searching for a new SUV or a new pickup truck, our GMC dealership near Saint John, IN, can help you get the keys to a high-class GMC Denali model. However, you might be wondering, what is GMC Denali? What Does GMC Denali Mean? For GMC fans who enjoy the finer things in life, GMC launched the Denali line of trucks and SUVs. These models provide you with top-of-the-line interior amenities, eye-catching exterior details and cutting-edge technologies. Upon first glance, you'll notice the LED signature lighting and iconic GMC headlights, as well as distinct chrome accents and aluminum wheels that let passersby know you're in control of an impressive and athletic vehicle. Thinking about buying or leasing a 2018 GMC Terrain or 2018 GMC Yukon? The 2018 Terrain Denali and Yukon Denali are outfitted with a head-turning grille that boasts a sophisticated design. Additionally, you'll gain access to more potent powertrains and extra performance-focused features when you opt for a Denali. With convenience amenities like a power rear liftgate and keyless entry, loading your GMC Denali up for weekend excursions will always be a breeze. 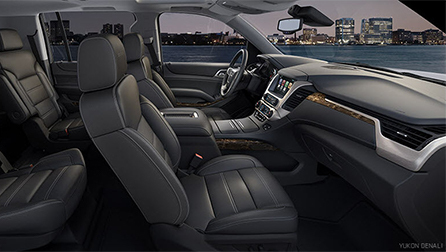 Relax into your leather-appointed interior with French stitching, and take advantage of the heated and ventilated front seats that come standard in Denali models, even when you're traveling to the worksite in a GMC Sierra 1500 Denali or a Sierra 2500HD Denali. You'll have access to the latest infotainment and safety technologies as well, including the GMC IntelliLink infotainment system, 4G LTE Wi-Fi® hotspot and Driver Alert suite of safety systems. Which GMC Models Have Denali Trims? Which GMC Models Have Denali Trims? GMC provides you with Denali trims on six popular 2018 models, as well as a handful of 2017 models. Buy or lease one of these new GMC trucks or SUVs to indulge in the refinement of the Denali trim. Want to explore our GMC Denali inventory? Visit Schepel Buick GMC today to test-drive one of these sophisticated and luxurious trucks or SUVs!